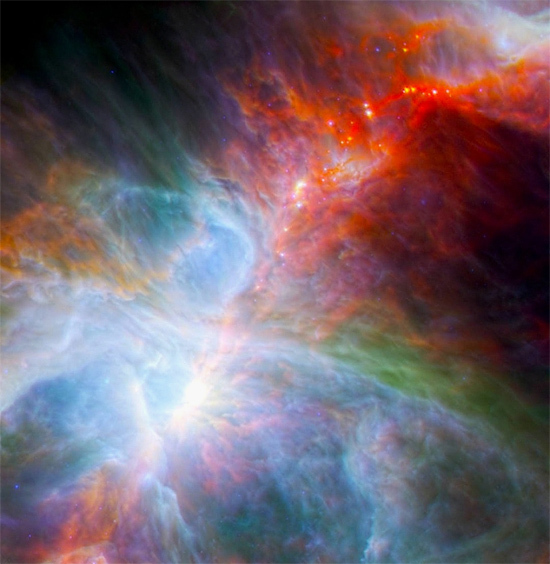 What causes the rapid changes observed in Orion Nebula “protostars”? Using a combination of NASA’s Spitzer Space Telescope and the ESA Herschel Space Observatory, astronomers found that so-called “young stars” are changing in brightness much faster than they thought possible. Instead of taking several years for material in the gaseous envelopes surrounding the proplyds to heat up and cool down, it is happening in weeks. On August 25, 2003 NASA launched the Spitzer Space Telescope into an Earth-trailing orbit. Spitzer’s primary “cold mission” used a tank of liquid helium to keep infrared detectors at -268 Celsius. That frigid temperature allowed the telescope to see infrared wavelengths as long as 180,000 nanometers. For comparison, the deepest red light frequency visible to the human eye is approximately 750 nanometers. After five years, however, the helium was exhausted, so Spitzer entered its “warm mission” phase, where it is still able to detect infrared signals in the 3600 to 37,000 nanometer range. This is because the ambient temperature of the instruments remains at -243 Celsius. The Herschel Space Observatory is similar to Spitzer, except that it possesses the largest mirror ever launched into space: 3.5 meters in diameter. Herschel entered orbit around LaGrange point L2 in July 2009, so that its sensitive instrumentation could be protected from solar radiation. Like Spitzer, Herschel’s helium coolant will only last for three years, starting from its May 14, 2009 launch date. In the image at the top of the page, information from Herschel at 70,000 and 160,000 nanometers is plotted using green and red, while Spitzer’s 8000 and 24,000 nanometer measurements are shown in blue. The longer wavelengths, or far-infrared, indicate the warmer regions in the nebula. Is this image revealing hot spots where new stars are forming? Could another phenomenon better explain the energetic nodes and the flickering? Instead, it is the capacitive, resistive, and inductive electrical environment in the Orion Nebula that is causing the material to change in brightness. Plasma’s behavior is driven by conditions in cosmic electric circuits. According to Electric Universe theory, fluctuations in those circuits can form double layers in the Nebula with large potential voltages between them. Electromagnetic forces draw matter from the surrounding space into filaments. The electrical power pushes them into “glow mode”. The electric charges in double layers are much stronger than gravitational and kinetic (thermal) forces. Double layers separate plasma into cells and filaments that can have different temperatures or densities. This can happen quickly. Astronomical theories have no mechanism that can form nebular clouds a thousand times less dense than a puff of smoke, or their energetic emissions. They do not know how matter moves through them with such velocity. The reason for that lack of understanding is that nebulae are not composed of inert gas, cold or hot, but of plasma.